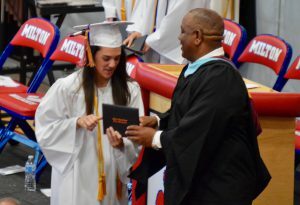 It was a wonderful day in the Copeland Family Field House on Sunday as we celebrated the one hundred and forty-eighth Milton High School graduation and the accomplishments of our 261 Milton High School graduates. 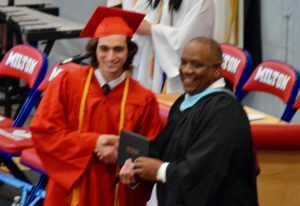 The field house was filled with MHS staff, family and friends and of course our graduates. 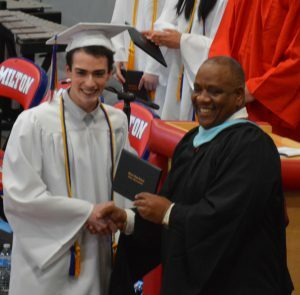 It was a moving ceremony and our student speakers – Salutatorian Timothy Karoff, Valedictorian Domenic Jancaterino and Class President MacKenzie Caputo – were outstanding. The MHS Band and Chorus Ensemble provided stirring music and the afternoon concluded with the Declaration of Graduation by Principal James Jette, a rousing cheer and an exuberant processional. 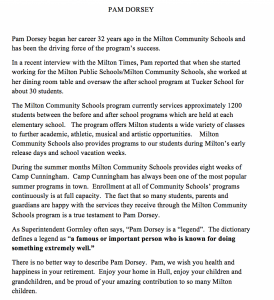 Thanks to Milton Wildcat News, you can watch the ceremony in its entirety here. 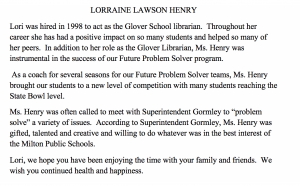 The photos below can be enlarged to share our graduate’s future plans. Last week’s Milton Times contained a full color spread of our 2018 Senior Class and this week will feature many highlights from our graduation ceremony. I encourage you to pick up a copy to celebrate our graduates! The School Committee invites all to please join them on Wednesday, June 13th at 7pm for a public forum to address increased student enrollment and space issues in the Milton Public Schools. The meeting will take place in the Milton Access TV Studio, Rm 245 in Milton High School. 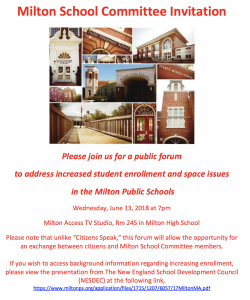 Please note that unlike “Citizens Speak,” this forum will allow the opportunity for an exchange between citizens and Milton School Committee members. 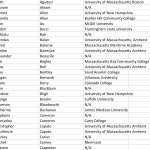 If you wish to access background information regarding increasing enrollment, please view the presentation from The New England School Development Council (NESDEC). The School Committee has updated the 2018-19 school calendar which can be found here. For the first time, MHS seniors will have the opportunity to take the SATs at Milton High School on October 10th during the school day. This is a new opportunity offered by College Board for the upcoming school year. We are asking any seniors (current junior class) taking the SATs on October 10th to be at school at 7:30am for registration. Testing will begin promptly at 8am. Students will have the option of taking the SAT with or without essay and testing will end by 12:30pm. 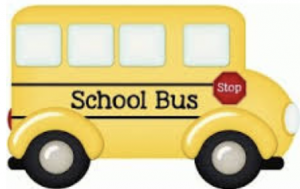 Once testing is concluded students will follow their regular school day schedule until dismissal. 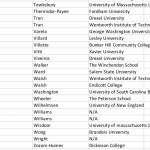 This is the same day our sophomores and juniors will be taking the PSATs, which will begin at 8am. Taking SATs on this day is not mandatory but we are hoping seniors will take advantage of this new school day testing option. You WILL NOT register for this School Day testing on the College Board website; you will register with UNIBANK through the MPS website. Go to the UNIBANK icon on the MPS homepage. 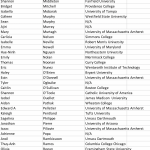 Registration is open now but will close on June 22nd as materials have to be ordered by June 25th. 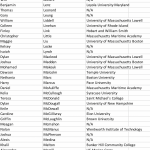 Once registration is closed there will be no opportunity to register, so please sign up ASAP if you are a current junior and want to take the SAT on Wednesday, October 10th, 2018. 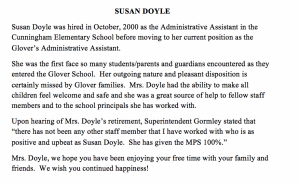 Please email Karen Cahill with any questions. 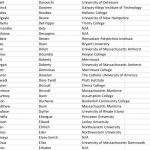 Congratulations to Anderson, Barron and Bridget! 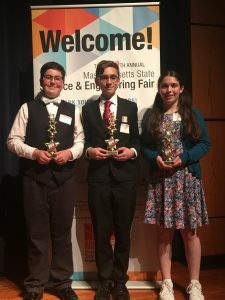 The Middle School Science Fair took place at Worcester Technical High School this past Saturday and I am happy to report that Pierce sent two projects to the fair and both received First Place awards! 8th graders Barron Clancy and Anderson Korman went as a team with their project on Developing Better Ventilation Systems for Refugee Tents, and Bridget McCoy, a 7th grader, also went with a project on the Effects of Temperature on Yeast Activity. This was Anderson and Barron’s second trip to State Science Fair and they received a 2nd place award last year while this was Bridget’s first time at the State Science Fair. All three students have been participants in the Pierce Science Fair since 6th grade and we could not be more proud of them. Our science fair participants learned a lot this year, and despite having a difficult Regionals experience, they persevered on to the State Fair and had the best year yet. I can see it, can you? Learning how to check for ticks. 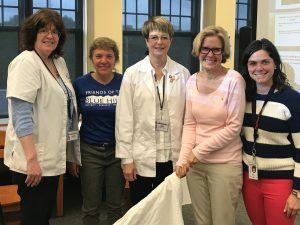 In recent weeks, The Friends of the Blue Hills teamed up with Milton Town Nurse Caroline Kinsella and our 4th grade Future Problem Solvers to help increase awareness of Lyme disease and how to prevent it. 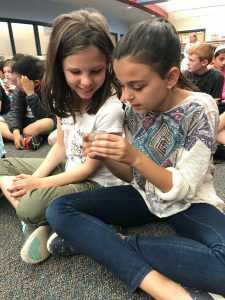 Over 300 hundred of our 4th graders in all four schools participated in an interactive program to understand how deer populations and ticks affect our community. 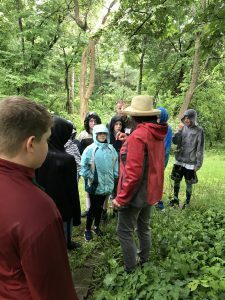 Students learned how deer populations degrade forest health and how unhealthy forests affect human health using Lyme disease as an example in their community. Finally, Ms Kinsella shared how to check for ticks and the signs and symptoms of Lyme disease. 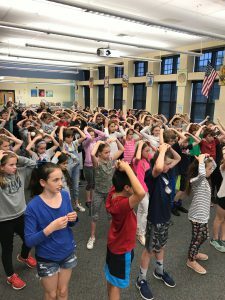 The Tour of Milton is an exciting opportunity for 5th grade students to learn more about their community. 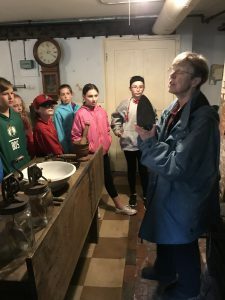 Gwen Labbe, the Education Director from Milton Historical Society, provides teachers with a binder of articles and pictures to share with students before the trip, so they can build schema before they explore the designated stops on the tour. 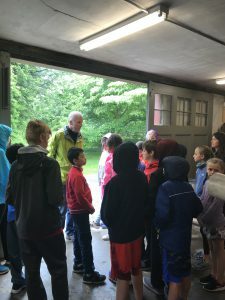 Students travel by bus to The Forbes House, The Wakefield Estate, Milton Cemetery and The Suffolks Resolves House learning about the history of their community throughout the day. 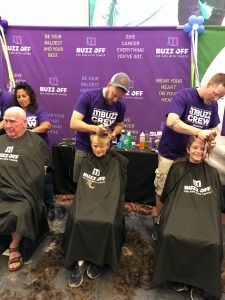 Declan Shields Buzzed Off for Kids with Cancer! Jackson (center) and Christopher (right) mid buzz! As promised, 3 of our Collicot students look a little different this week as they Buzzed Off for Kids with Cancer over the weekend. 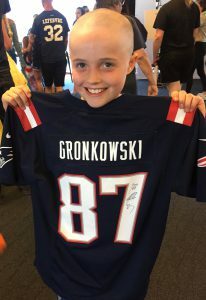 Christopher Ennis, Declan Shields and Jackson Wagner all raised money by getting pledges to buzz their hair to support kids with cancer and last weekend at Gillette Stadium they delivered on their promise! Gronk also got buzzed and you can see him (and Christopher at 33 seconds and Jackson at 55 seconds) in this news clip. 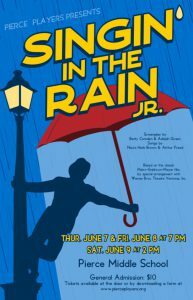 The Pierce Players will perform its production of Singin’ in the Rain Jr. for the Milton community on Thursday, June 7th and Friday, June 8th at 7PM and Saturday, June 9th at 2 PM in the Pierce auditorium. Tickets are $10 and there are limited tickets available at the door for all three performances, 45 minutes before the show starts. Find out more about the show here. If your child has an Individualized Education Program (IEP), we need your input! 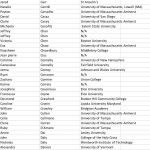 Each year, the Massachusetts Department of Elementary and Secondary Education (DESE) surveys families of students with an IEP in selected school districts to determine how well your child’s school is communicating with you and promoting your engagement in your child’s education. It’s your district’s turn this year. The web-based survey will be open from October 1, 2017– June 30, 2018. You can complete the survey online or using a mobile device with this link: http://www.surveygizmo.com/s3/3792854/Family-Engagement-Survey-2017-2018. Your participation in this survey will help your school district to improve family engagement for all students. Thank you for completing the survey. There is a new “Sandwich King of MHS” and much to the chagrin of Mr. Kelly and Mr. Mack, it isn’t them! Congratulations to Mr. Jette on his win with his “Turkey Club Remix”. 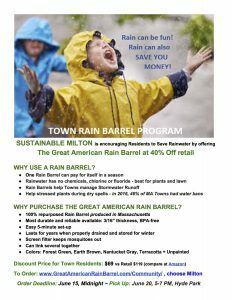 The Milton Music Festival returns to Gov. Hutchinson’s Field a top of Milton Hill on Adams Street on June 23rd and 24th. On Saturday night, sit and enjoy the splendid view of Boston as our top-notch line up of musicians fill the airwaves with some of your favorite tunes. We will have nearly FIVE hours of nonstop music. This year we will have a “Little Bit of Country and a Little Bit of Rock and Roll”. Be sure to wear your cowboy hats and boots! There will also be a large open air dance floor waiting for you. The kids will enjoy the HUGE sand box and ride our GIANT slide. Try your hand at corn hole and volleyball, and enjoy the Wahlburgers Truck, Montilio’s Pizza Cart and The OK Saloon’s cold draft beer and wine as well as ice cream, fried dough and more! When the sky darkens and the lights twinkle in the distance, right around 10pm, the fireworks will light up the night with the Boston skyline as your backdrop. This celebration is always an evening to treasure. Don’t forget to bring your lawn chairs, blankets and bug spray! 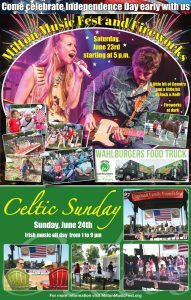 The fun continues on Sunday with Celtic Sunday from 1-9 PM. Celtic Sunday 2018 will highlight many of Boston’s best Irish bands, musicians and vocalists. Each of them brings so much talent to the Boston Irish Music scene. Our friends from M.J. O’Connor’s Irish Pub will be serving Guinness, Magners and other ice cold beer and wine. Grab your chair and sunscreen, there will be something for everyone, young and old. There will also be handicap parking available at the field on Sunday only. 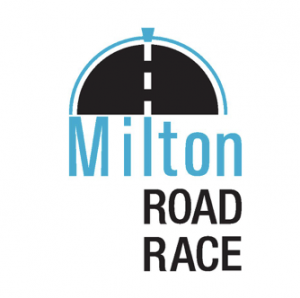 For more information on free parking, complimentary shuttle service and entertainment please visit MiltonMusicFest . 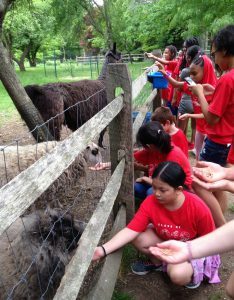 Head to the Eustis Estate for the Head to Toe Family Programs on Friday, June 15 and Saturday June 16, 10am – 2pm. This summer the Milton Art Center is offering nine weeks of summer classes with separate morning and afternoon summer art class sessions for children, ages 5-12, and Summer Studio for teens, 12-17, who enjoy bringing their ideas and stories to life. New this summer are creative writing courses and figure drawing for adults. Each week something new to learn in drawing, painting, mixed media, sewing, clay, digital media, paper mache sculpture and more. Sign up now! Our 7th and 8th grade students had a wonderful showing at this year’s Great East Festival! 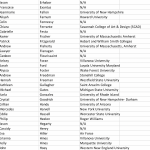 Congratulations to all, performances can be viewed below. Great East Pierce MS Band 7 & 8 GOLD! Great East Pierce MS Cambiata Chorus 7 & 8 GOLD! Great East Pierce MS Treble Chorus 7 & 8 PLATINUM! Great East Pierce MS Strings 7 & 8 PLATINUM! Girls Lacrosse and Boys Tennis had their season cut short after 1st round losses to Old Rochester and Hanover, respectively. They each had great seasons! Baseball and Softball both play tonight in the first round of the tournament. Baseball travels to Dartmouth for a 4:30pm game, while Softball travels to North Quincy for a 6:00pm game. Rugby will host Marshfield on Friday, at 5:00pm in the state quarterfinals! Good luck to all! Milton High School is pleased to announce that on Tuesday, June 12th at 6:30pm, the Athletic Department will be hosting John Whitesides from the National Guard and the Boston Bruins Organization, as part of the BFIT Performance Series. 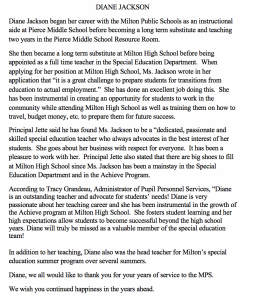 Following the presentation, to which all grades/parents are invited, all incoming freshmen students and parents should stay for a brief presentation on Milton High School Athletics. All details can be found here. There will be a Cans for Cats and Car Wash combo on Saturday June 9th from 9-12pm at Cunningham (note the venue change for Cans for Cats just for this month). MHS Track teams will benefit. Cross two things off your list at once! Students: I would like to recognize our 261 Milton High School 2018 graduates, every one of whom will bring their special talents with them as they embark on the next chapter of their lives. 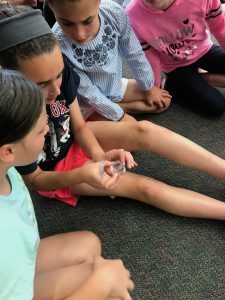 We know these young people are the future leaders of both our local and global communities and it has been a privilege to have them as a part of the Milton Public Schools community. 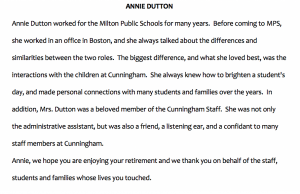 Staff: Last night we honored our recent retirees from the Milton Public Schools at a reception at Milton High School. 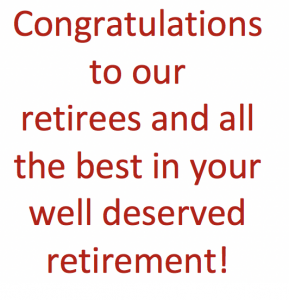 These long time educators have taught many of your children throughout the years and I hope you will join me in wishing them a well deserved happy retirement. 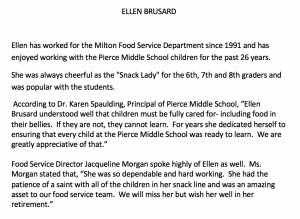 Thank you and congratulations to Ellen Brusard, Elizabeth Carrigan, Pamela Dorsey, Susan Doyle, Mary Duggan, Annie Dutton, Debra Fidrocki, Lorraine Lawson-Henry, Diane Jackson, Judith Lemelman, Anna McReynolds, Ann Marie Noonan, Mary Foy Rooney and Nancy Trifone-Seales. 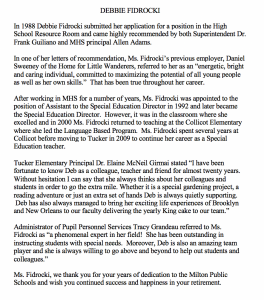 You can read a bit about our retirees in the pictures below, which can be enlarged by clicking on them. 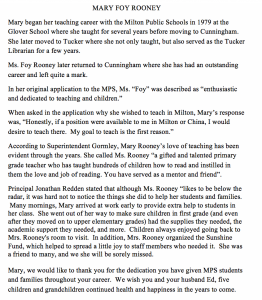 To our retireees – your contributions to the Milton Public Schools will not soon be forgotten. Volunteers: Phew! 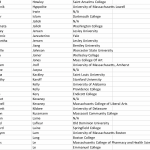 Graduation season has come and gone and it just would not be possible without the hard work and commitment of the dozens of volunteers who contribute to the end of the year festivities. A heartfelt thanks to the Boosters, FAME, the All Night Party Committee and the MHS PTSFO. 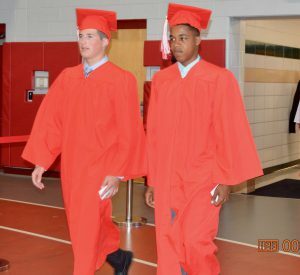 The many end of year events that make May and June special for our seniors and high school students would not be possible without your creativity, “get it done” attitude and willingness to engage in these valuable end of year rituals. 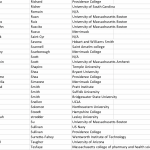 Thank you to my blog contributors this week: Charlene Roche, Christie Chiappetta, Karyn Viveiros, Sean Lopresti, AJ Melanson, Karen Cahill, Jane Barrett, Sarina Burke, Justine Novak, Jen Grubler, Holly Concannon, Jon Redden, Sara MacNeil, Noel Vigue, Amy Gale, Nancy Warn, Jackie Morgan, Ryan Madden, Elaine McNeil-Girmai, Cat DesRoche, James Jette, Amy Gale, Rebecca Damiani, Dawn Sykes and Bernadette Butler.